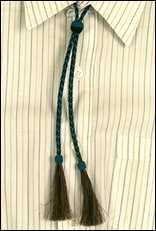 Colorado Horsehair is proud to offer traditional western neckwear of exceptional quality. 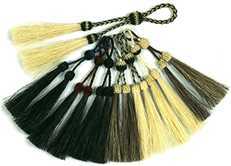 Hand braided horsehair construction is finished off with unique knots and color accents. Truly distinctive, a Western Wear classic. Offered in Black, Tan, Natural. Adjustable slider fits over shirt button. Offered in Black/Natural, Tan/Natural, Blue Comb., Red Comb.